Today, we’re talking about what you can try if your dog is actually in need of GAINING weight. We’ve covered some health reasons for sudden weight loss in a previous post, but what if you have a dog who just has a high metabolism, like my Mylo (as seen above)? You’ll also want to bear in mind that some weight loss can happen during the winter as your dogs’ have increased caloric needs, but weight loss can happen at any time of the year. How do I tell if my dog is too skinny? Well, there is no magic way to tell. The perfect weight for your pet will vary depending on your dog’s breed and if you are unsure about your pet’s weight, do check in with your veterinarian. 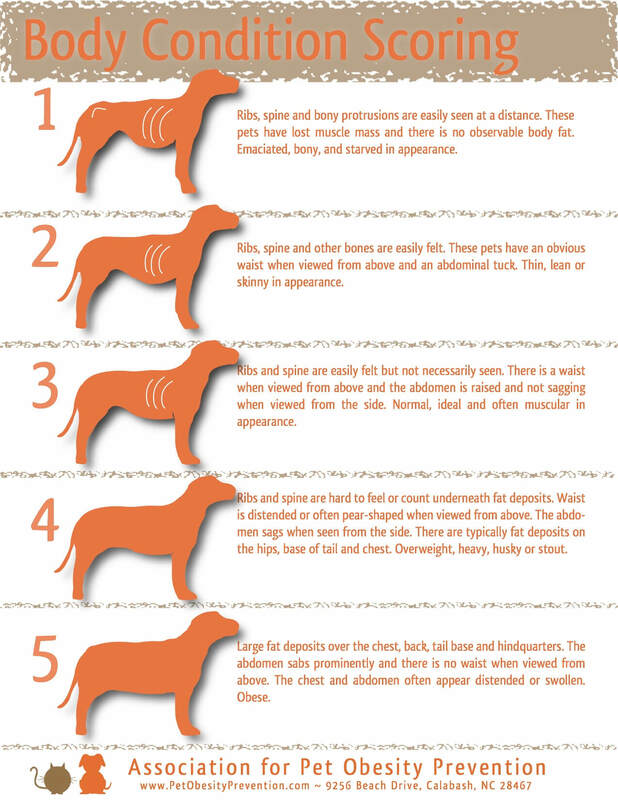 It is often suggested your dog be a solid three on the Body Conditioning Scoring infographic (as seen below). 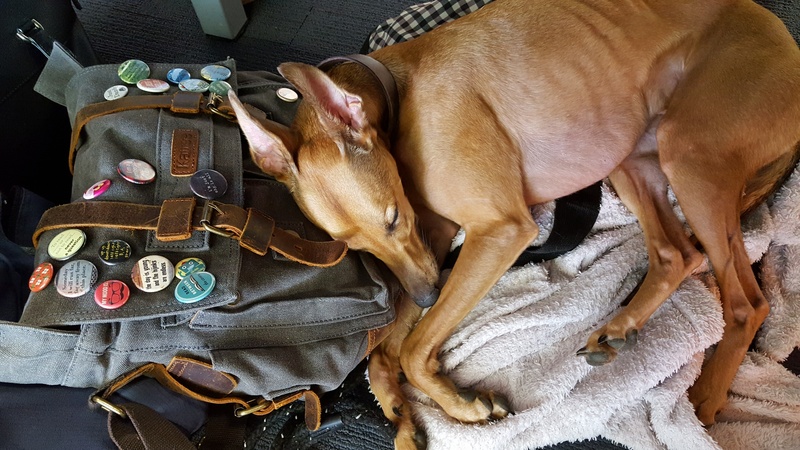 Sighthounds, like Mylo, are naturally thinner than other breeds and would be overweight if held to the same standards as a Golden Retriever. The general gist is your dog should have a defined waist and just enough padding on their ribs for them to not be visible. Take a look at the infographic below for more detailed information. Mylo would be in between a 1 and a 2 on this scale. He does have defined muscles and a shiny coat, so he doesn’t actually look starved or emaciated but we would like to see a little more meat on his bones. He gets very cold in the winter and he tends to lose a little bit of weight, so it’s a battle to keep any weight on him! According to the breed standard, he should be solid 2 heading towards 3. 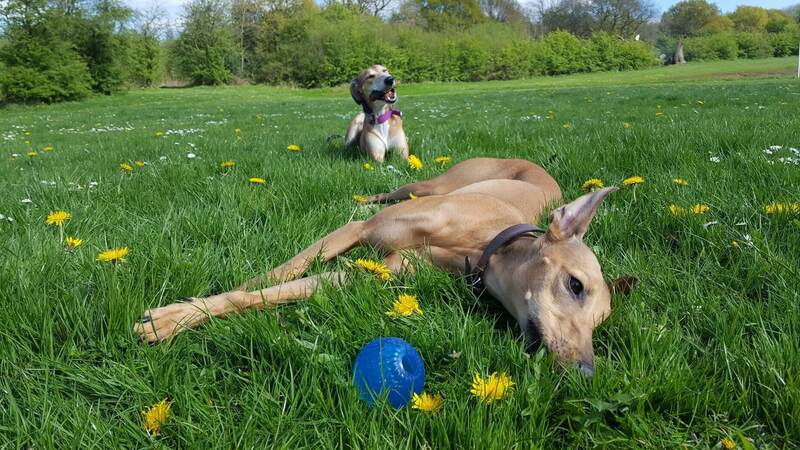 Whippets are meant to be lean and you should be able to see the last 3 ribs. Where does your dog fit on this scale? Image from the Association for Pet Obesity Prevention. Remember that one dog’s perfect weight is another dog’s over or underweight. I do want to mention again, as this is important, you should always check with your vet before starting any weight loss or weight gaining regimens for your pooch. My husband and I do a lot of different things to help keep Mylo in great condition, even though we think he’s still on the skinny side. It’s exactly what it says. Add more food to their bowl at each meal or adding in another meal, depending on your schedule. For Mylo we give him more food at both meals. It can be a good idea to look into the quality of the food you’re feeding them, cheap foods can be all bulk and lower calorie. You do need to be careful not to overfeed them as that can end in “loose stools” (yuck) as your dog isn’t getting a chance to digest the food properly. Many short-haired breeds get cold in the winter months and putting them in sweaters or into pajamas can help them keep the weight on as it helps their bodies regulate their core temperature. If your dog is cold in the house, imagine how they must feel outside! Make sure they have a coat. We’ve got a water-resistant one for rain that’s also fleecy for warmth. Mylo actually helps me put this on when I get it out, he knows that means we’re going for a walk. And a W-A-L-K is one of his favorite things, probably second only to treats. The lovely Mylo and Lily after a massive bout of zoomies. Mylo doesn’t look too skinny at this angle… Photo from Andria E.
Having two naturally skinny dogs, one who is on the skinny side and one who has put on a few pounds… Means I have to be very aware of what they’re eating and what the temperature is like outside. Too skinny and extra pounds aren’t good for them, but I do it for the love of their pointy faces. Wouldn’t you?